It’s been quite a few years since I first made this lentil soup. I stumbled upon the original recipe on a snowy night and since then it’s become a winter staple. I hesitate to call this a soup only because I leave the texture thick, much more stew like. The flavors are warm and inviting without being too over the top. This recipe has also been quite the hit in the realm of baby food. I’ve been making a big batch and waiting to add the salt/cayenne until after I’ve removed a portion for Mack. Best of all? This meal is even better the second day meaning you’ve got lunch without any extra work. In a large stockpot combine lentils and vegetable broth, bring to a boil. Reduce to a simmer and add the sweet potato, carrot, and half the ginger. Continue to simmer until sweet potato is almost tender, about 10 minutes. In a small skillet, add curry powder and toast until fragrant. Remove from skillet once toasted. Return skillet to stove and add coconut oil. Next, stir in remaining ginger, garlic, and raisins to skillet over medium low heat. Sauté for one minute, just until the garlic is fragrant. Add tomato paste and continue to cook for 1 to 2 more minutes. Finally, stir in the curry powder. Add the tomato paste mixture along with the coconut milk and salt to the lentil base. Stir and let simmer for 15 to 20 minutes. I served this soup more as a hearty thick stew so you may need to play with the consistency by adding more water. – Because I’ve used vegetable broth in place of the water in the original recipe, I decrease the salt quite a bit (but then find I add a bit right before eating). I recommend starting on the low side, tasting, and adding more as needed. This soup is one of my favorite what I consider ‘pantry meals.’ I typically keep all the ingredients on hand and if I’m in the mood for something comforting, this soup gets made. I haven’t always kept golden raisins on hand but I do now. They plump up nicely and add small burst of sweetness throughout the soup. I’ve found myself adding them to a lot my spicy dishes. Greens: I’ll add in spinach at the last minute for an extra pop of color and vegetables. A couple handfuls of baby spinach wilt nicely into the lentils. Split Peas: I originally left the split peas out of this recipe because I didn’t have any on hand at the time. I fell in love with the lentil soup (and now the texture of red lentils only is great for babies). However, you lose a bit of the texture without the split peas. Check out the original recipe for instructions about these. Also, some readers have used brown/green lentils which do not soften as much as the red (and would give the soup a bit more texture). Grains: I go through phases with the grains I have on hand. When I first started making this recipe, I loved it with brown rice. Now I find I turn to millet (if I’m looking to keep this gluten-free) or bulgur (which is nice if I’m in a hurry). 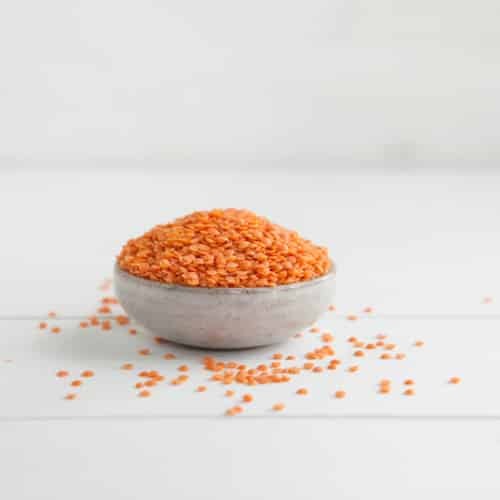 Red Lentils are best in soups and stews because they don’t hold their shape as well as their brown/green counterparts. 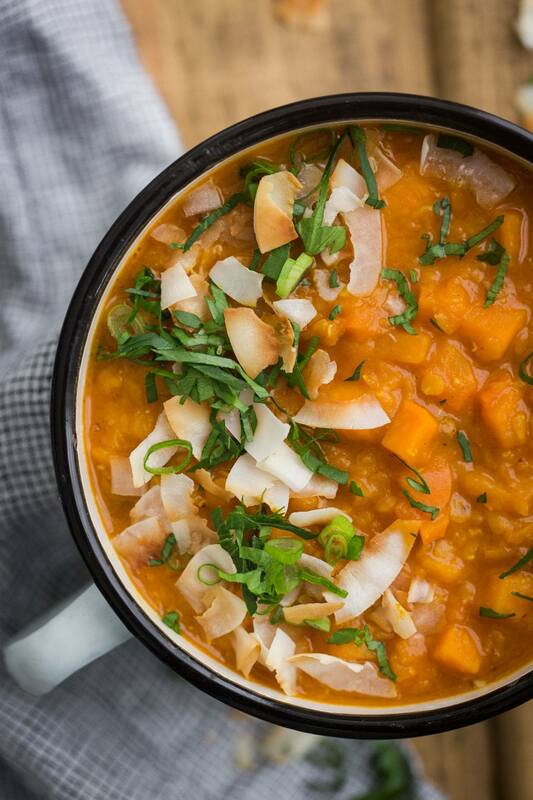 I had every intention of making your Sweet Potato and Gorgonzola Farro Risotto later next week when my hubs is out of town, but now you go ahead and post this soup recipe… argh! Now I don’t know which one to make ;). 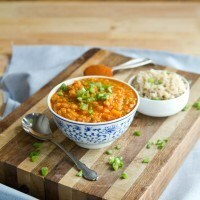 I LOVE curry and have recently become rather enamored with red lentils. Plus, sweet potatoes and coconut are two of my favorite foods. I have to make this soup soon! This might just be my new favorite! Can’t wait to try! I’ve made this recipe too. A definite winner! Beautiful! All these flavors sound great together. I love lentils, too. I just discovered your blog and I love love love everything here and I can’t wait to try your recipes!! And I love how everything’s vegetarian and seasonal…just what I need!! I cannot wait to make this recipe! I will be making it early next week! Thanks for sharing the recipe! It sounds just ohhh so yummy….and probably perfect with my new favorite easy crusty bread recipe! Very envious, my Mum, now 88 years old lives 5,000 miles away, yes you are so fortunate~enjoy. I am going to make this recipe , it sounds absolutely yummy! Thank you for sharing it. I made this tonight for dinner — it is excellent. Thanks for another great recipe! Looking forward to gathering the goodies to prepare this curry..
Made this alittle while back and it was delish! Oh, an just as the weather has turned to shiver, and sopping wet. A good reason to stay indoors and see out of the window! Sounds delicious! I thought lentils were high FODMAP though? Hi Jamie, I’m not sure- I don’t follow a low-FODMAP diet or really know anything about it. I found it too bland. I would add 2 tbsp. curry and perhaps a few pepper flakes. Other then that the basic recipe is good. I made the soup and put some in 2 cup mason jars and put in freezer. I rarely cook and am not too good at it… But I made this last night and it was fantastic! I found it with the Yummly app, and I will probably put a little more curry in it next time, as it wasn’t as strong of a flavor as I would like but I’m doing the Daniel fast right now and really trying hard to cook my own food so this was perfect. Can’t wait to try more of your recipes! 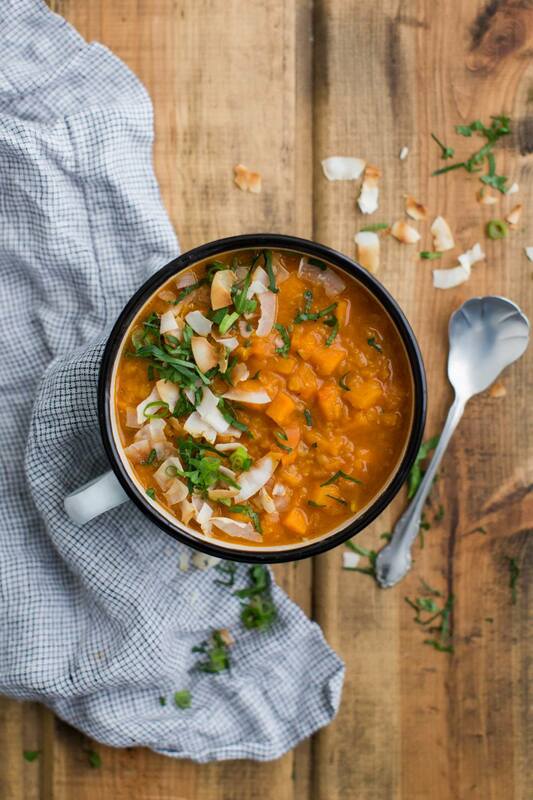 the low fodmap curry lentil soup is in no way low fodmap and the tag needs to be removed. Lentils and onions are def high fodmap. You are going to make people sick. Hi Tracey, I don’t follow a fodmap diet and have no such tag on my site that indicates that this is a fodmap (in fact, I was unaware of this diet up until about a few months ago when another commenter asked and I said ‘I don’t know- I don’t follow fodmap’). Is there another site that is pointing you here that indicates that it is? Hi Marty- not sure if you know how pinterest works but I have no control over how people pin a recipe (or really, any control over any content on a site that isn’t mine). I’ve never mention the FODMAP diet on my site and so this person is labeling it based on their view, not mine. If you’re troubled by it, I recommend commenting on the pin on pinterest- but there’s nothing I can do. This soup is delicious! Just made it and had two bowls! I wish I can have more but my stomach says STOP, TOO FULL! I put a russet potato instead of sweet potato. This soup will be added to my rotation! Yeah! Hopefully I can use brown lentils. They’re what I have on hand. I used brown lentils, frozen squash, and regular onions. It came out great. I just added some red pepper flakes and garlic salt at the end. This sounds and looks like the most warming and comforting meal ever! Sounds fabulous! I`ll add butternut squash chunks & spinach too & eat with quinoa. My heart is happy just looking at this comforting bowl of soup! Sharing with my readers for sure! I made this tonight with 1/2 red lentils and 1/2 yellow split peas, and butternut pumpkin/squash in place of sweet potato. My curry powder was just a supermarket blend, market mild-hot. Super tasty. I’m not much of one for a lentil soup unless it’s thick and hearty like this. I’d eat this for days in a row with no complaints! We made this recipe, and it was delicious. Normally, I like to put chutney in red lentil soup, but it wasn’t needed with the sweet raisins. The golden raisins made it more visually appealing than if you used dark raisins since the golden raisins blended with the oranges and yellows in the dish, but I think the taste would be pretty much the same with dark raisins. This dish will be part of our standard meal rotation. We might add some spinach the next time we make it. Just made this according to your recipe above, except I made it into a “one pot recipe” by toasting the spices and tomato paste first and then cooking the lentils, sweet potato and carrot in the same pot….anyway, it turned out super delish! So, so tasty and seems hearty enough for my lunches all week. This recipe turned out really, really great. It was perfectly spiced, and flavorful, and relatively easy to make. I will definitely make it again. Healthy, delicious, and nutritious – can’t beat that! My wife and I tried this one the other day. We added a couple of our own ingredients (organic, flax-seed powder and raw hemp seeds). Made this last night and served over brown rice. Yum! Delicious soup! I’m so happy I found your version because I had some carrot and sweet potato to use up. I also bought some spinach to wilt in it and it’s such a great addition. I made batch to bring to lunch for the week and can’t wait to dig in!